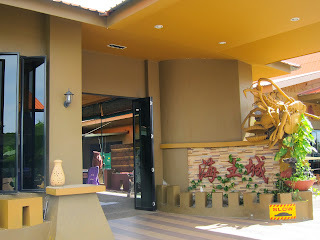 One More Bite Blog | Food | Travel | Adventures: 1MB Travels: Sabah, Malaysia: Ocean Seafood Village - "No Menu" Choose-Your-Own-Adventure Live Seafood Dining Experience at Fab Prices! 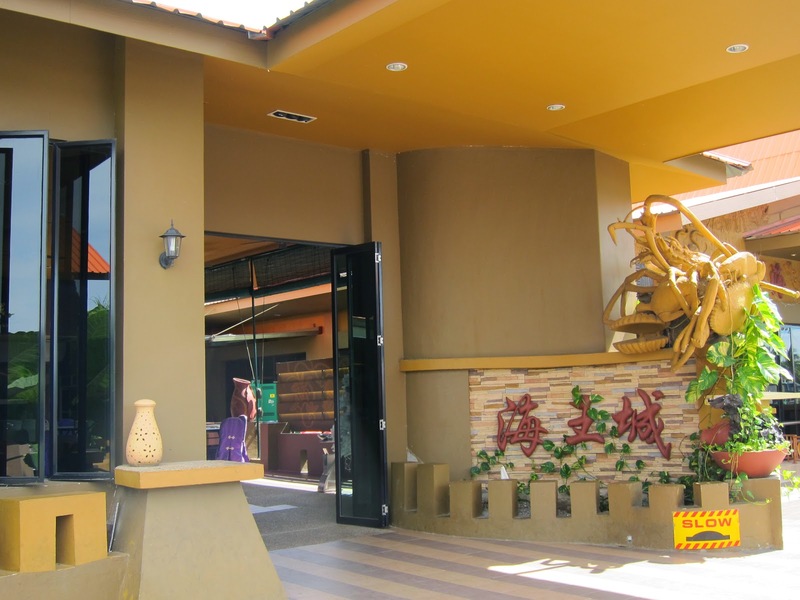 1MB Travels: Sabah, Malaysia: Ocean Seafood Village - "No Menu" Choose-Your-Own-Adventure Live Seafood Dining Experience at Fab Prices! Just returned to a very, very cold L.A. (what happened to warming back up while I was gone...!) A few hours in and our vacation in sunny Borneo and warmer-than-LA HK seems a distant memory from a different world. At least I have my memories of the amazing culinary adventures from both places that I can relive as I post about them! While on vacation with the fam in Sabah, Malaysia, we managed to venture off the compound of the resort to check out local flavors. We started off with a self-guided excursion through the city center of Kota Kinabalu - through all the ocean front produce and craft markets (details in separate Sabah adventures post), to a local shopping center - then rewarded ourselves with what we had truly ventured out to the city center for lunch at a place highly recommended by the travel agency guide as well as foodie bloggers: Ocean Seafood Village. At first, our cab driver got confused and took us to an open market food court style place - so the first tip would be - let your driver know you want to go to the location next to the Jalan Hotel, close to Api Api Center. When we arrived at the second stop, we knew we were at the right place when we saw a relatively upscale restaurant, where we were greeted by two giant lobster sculptures. 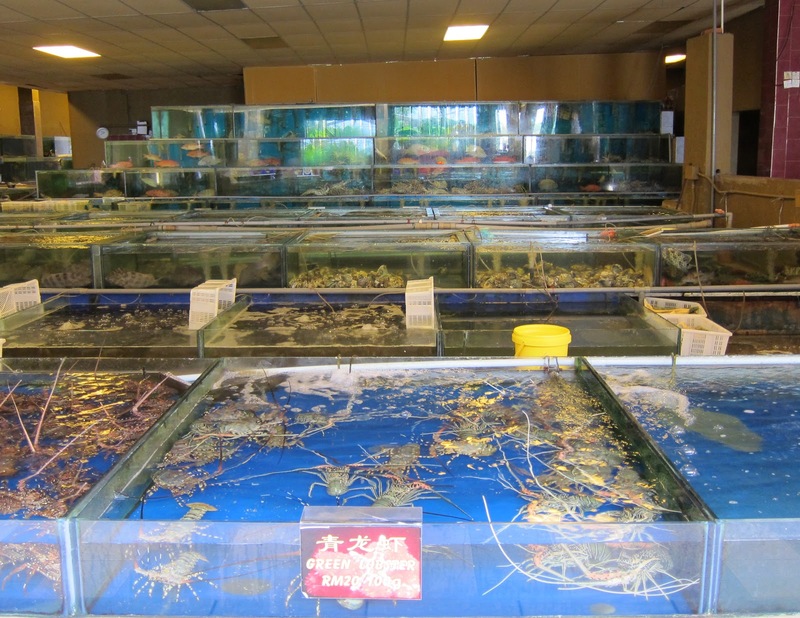 The first thing we saw when we stepped inside, was row upon row of tanks containing all manner of live sea creatures as far as the eye could see. Nothing excites my family (ok, at least my mom and I) like live seafood that are still swimming before we eat. But apparently we were not supposed to enter through this entrance first, and were immediately led to the main dining room to be seated. 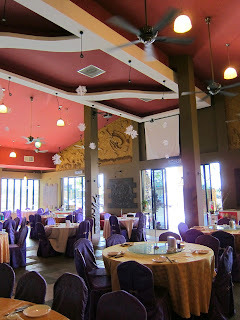 The dining room was moderate size, with round tables set up banquet style (the larger ones set up with lazy susans, the better for efficient dining in big groups). As with my policy with movies, with food I just like to get the general gist of reviews (good/so-so/bad) without reading details, so that I could get my thoughts together first without any bias / noise. So, I was quite surprised when our server informed us that the restaurant did not have a menu! At Ocean Seafood Village (and other similar seafood restaurants in KK and HK), you make your dining experience the way you want it - choose your own adventure. etc. or simply instruct your server on the type and weight you want and let them make the selection for you), tell them how you want it cooked, and then the dishes of incredibly fresh seafood magically appear at your table. So the designated seafood selectors from our table (my mom and I) were led back to the tanks to 'shop' for our meal. We had an amazing time just peering into all the tanks, checking out some creatures we'd never seen before, like this giant King Lobster with tarantula-like legs - so huge it looked like it could go head-to-head with us if we tried to grab it from the tank (luckily, we would have experts there to handle that), Mantis Prawn (equivalent of Chinese Lai Liu Har, but we've still never seen the live creature before) as well as various local types of fish. I know the burning question would be - how do you know how much your meal's going to cost, if there's no menu? There are prices by the pound posted in front of each tank, and if you like you can ask for exact weight and costs before going back to your table. There's also a negligible fee for tea and hand towels, as well as the small plates of pre-meal snacks which consisted of shrimp chips, seasoned peanuts and pickled papaya. 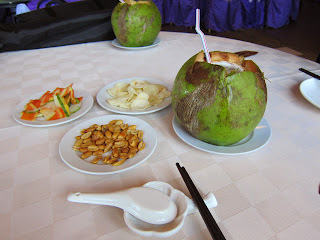 Looking to get the full local experience, for beverages we ordered a round of Pandan Coconuts in the shell. 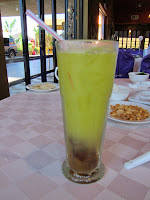 Like all the other fruit juices we've had in Sabah, it could be served a little colder, but it still tasted great - untouched by human hands except for the cracking of the shell to reach the liquids inside. Perhaps it's just challenging to fit all those huge shells in the fridge (and they did run out when we tried to order seconds). On to the seafood! 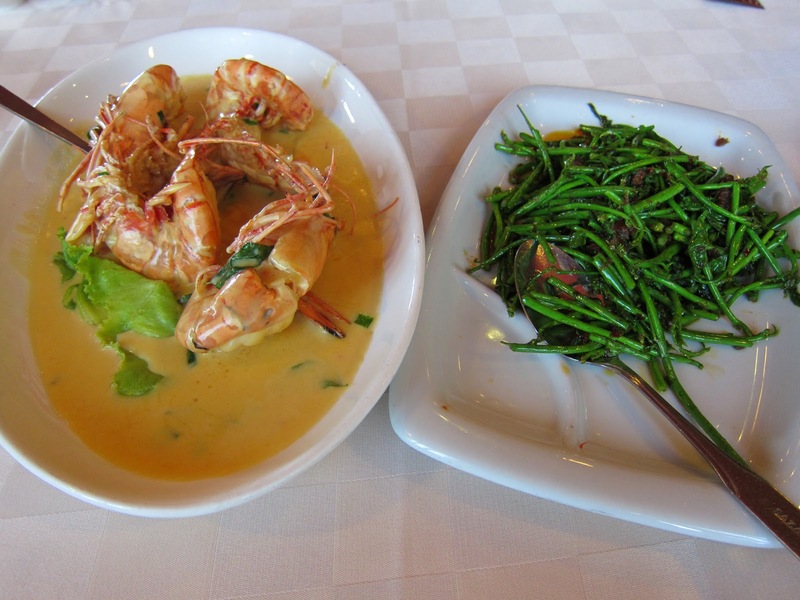 We started with Sabah specialties: Tiger Prawns in Butter Sauce, and Sabah Vege. My mom was at first concerned that the butter sauce would be too rich, but had reluctantly agreed to try it since it was only to be found in Sabah. The dish turned out to be amazing and one of our favorites for the meal - the prawns were incredibly fresh, juicy, sweet and the sauce was creamy and as light as a sauce made of butter and cream could be. 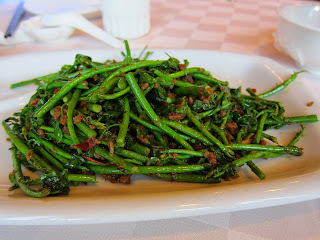 Sabah Vege is another Sabah specialty - as there are a lot of Chinese immigrants in Malaysia, a lot of the people speak Chinese, so my parents were delighted to find that our server could explain the dish in Chinese to us. The veggie is basically "Shue Jai Choy" or potato vegetable - they simply harvest the green stems that grow with spuds, above ground. It can be cooked a number of ways, but Sabah Vege proper is with a sauce reminiscent of Cantonese "XO sauce" made with dried shrimp and chilis. I don't usually like veggies, but loved this flavorful dish and wish I could find a place that serves it back home! Next up was the Lobster - we asked for it to be halved, boiled and served in "top broth" - this format made it easier to get at the meat in a larger chunk, gave access to the tasty tomalley and any caviar inside / around the head area, while the clear soup gave the lobster just the right amount of flavor while still letting the natural sweetness of the lobster meat shine through. We wanted to try the Coconut Crab (so named because its claws are so strong it could crack a coconut shell with its bare...claws). 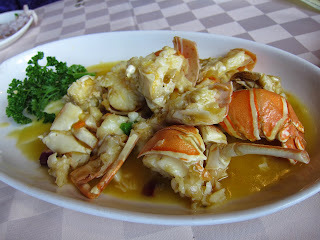 But unfortunately they were not in season - the only crab available during our visit was Flower Crab. We also asked for this to be cooked in top broth. Our only note about this dish was that we wished we had ordered larger crabs - even my parents who normally don't order crab because it's too much 'work' to get at the flesh, loved the taste - so sweet, structured but super tender - and wished we could have had more. Our bill with all that seafood? In Ringit Malaysian currency: 280 TOTAL, which translates to just a little over $700 Hong Kong or about $92 US!!!!! For three people! At that point we only had one day left in our stay in Sabah - and decided we needed to come back to Ocean Seafood Village one more time before leaving. 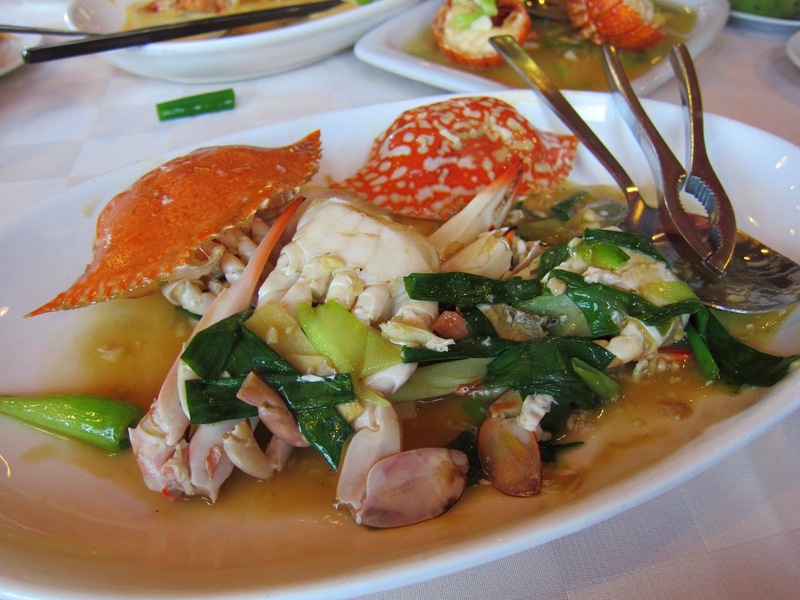 There were some other recommended local spots that we wanted to check out for a greater sampling in the area, but Ocean Seafood Village was so amazing that we decided to go back for our last meal, literally before our ride to the airport. On the second visit, we had Lime Juice with Salted Plums (the preserved fruit seems to be as popular here for beverages - as it is to Singaporeans for food). With the sourness of the lime juice, adding 5-6 salted plums ended up being overkill - this drink would have been nice with maybe 1 salted plum to add just a touch of salty and tart. 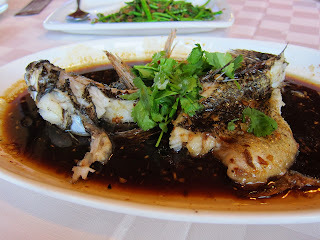 As for seafood, we wanted to try a local fish - and went with our server's recommendation of Steamed Marbled Gobby Fish with Soy Sauce and Sesame Oil. Chinese people like to eat the flesh in the 'cheeks' of fish because it's the smoothest and tenderest (and bone-free) - well the entire Marbled Gobby Fish had the texture of fish cheekbone meat. There were a bunch of thin bones to work around / eject - which turned my dad off (he usually avoids fish for this reason) - but the taste and texture overall was worth the work. Like the crab, we just wished we ordered a bigger fish so that the meat to bones (shell) ratio would be to our favor. 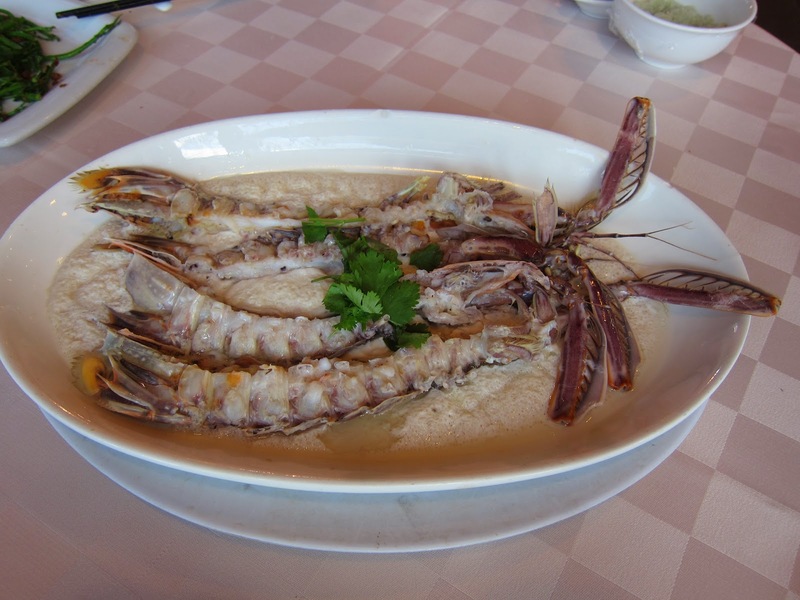 Next we tried the Mantis Prawn, which looked like small lobsters with longer tails and shorter heads, and black and beige/grey striped shells when we saw them in the tank - and are supposedly named for their resemblance to praying mantis. 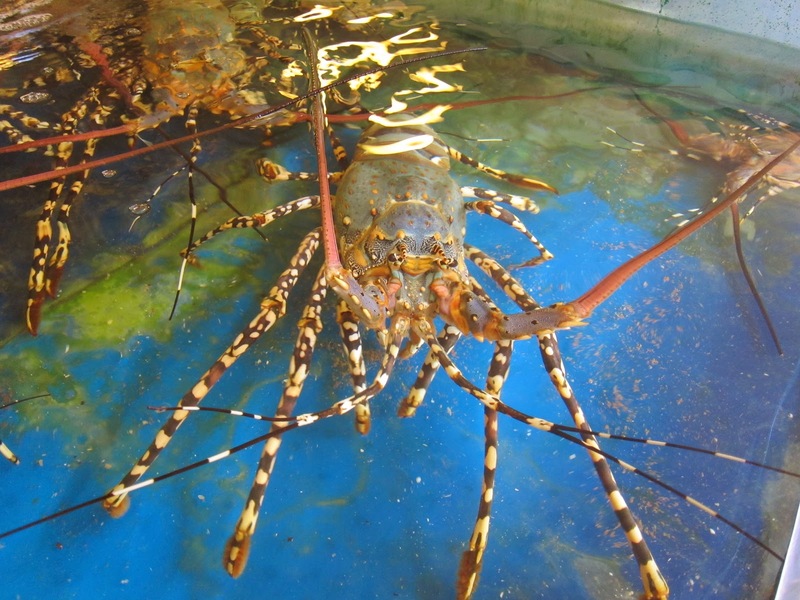 But when they arrived cooked, they looked more like a hybrid of lobster (spiny and hard shell) and shrimp (long and skinny). We had this one steamed with egg whites, so that all the juices would flow into the egg, which could then be worked into a bowl of rice for extra flavor. This dish was good, but again took a lot of work to get at the 'meat' - there is supposed to be a specific way to snap the flesh off the spine, but we weren't sure how at the time. In terms of taste, the Mantis Prawns were sweeter than the lobsters, but this dish definitely did not have as big a payoff (not much meat for all that work, and not as big of a bargain). Worth trying as a local item, but if you have limited numbers of people and can only stick to a few dishes, would recommend getting the butter tiger prawn or a lobster dish instead. Speaking of lobsters, we couldn't bear to leave without having this again, especially since it was so cheap! So we ordered lobsters boiled in "top broth" again, bigger ones this time, but chopped up versus split sideways. We decided we liked split sideways better - the meat came off in clean, versus us trying to scrape small pieces out of the chopped up segments. 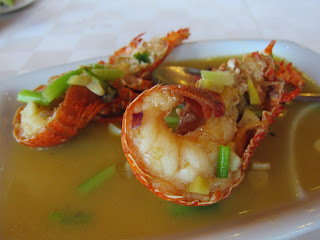 It was just felt more rewarding when we were able to spear and rip the entire tail out of the shell in one fell forkful - it also has a better 'mouth feel' (popular Cantonese term) in each bite, and allows bigger pieces for the natural flavors of the lobster to come through along with the flavors in the broth. Forget Shangri-La - after those two meals, paradise for me would be to live in Sabah...or specifically, next to Ocean Seafood Village. dineLA - Ready, Set, Go! Sweepstakes alert! Win dineLA for a Year!